Southampton, PA — Plastic tubing manufacturer NewAge Industries was honored to host Senator Bob Casey on Friday, January 11. 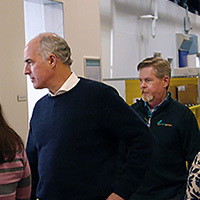 Senator Casey visited to experience the culture of this employee-owned company and to hear about the value of employee ownership directly from its employee-owners. Senator Casey participated in a round table discussion moderated by Jeff Johnson, a 28-year team member, who gave an overview of how and why Ken Baker, NewAge's CEO, arrived at the decision to become employee owned. Southampton, PA — 2019 marks NewAge Industries' 65th year in business. Started in 1954, the company distributed plastic tubing for industrial uses and today manufactures dozens of tubing styles for markets such as biopharm and pharmaceutical, medical, food, appliance, chemical and for various applications involving fluid and gas transfer. NewAge is employee owned and prides itself on providing customers with high quality products, good selection, quick delivery, old-fashioned personal service and a fair price. 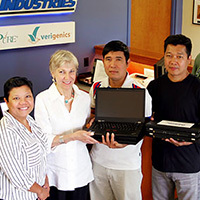 Southampton, PA — Plastic tubing manufacturer NewAge Industries made a third donation of laptop computers to the Caramanico School in Ratanakiri, Cambodia. NewAge employs many team members originally from Cambodia and is honored to help the country's students in this remote location. The school powers the computers with solar energy. It serves students up to twelfth grade and helps provide clean water, meals and housing. NewAge is involved with schools and students in the Southampton area as well. Southampton, PA — New AdvantaSil Ultra Low Temperature Silicone Tubing is designed to aid pharmaceutical and biopharm manufacturers with protecting their high-value cell and drug products. The platinum-cured tubing is engineered for Single-Use applications involving cold storage and transport. 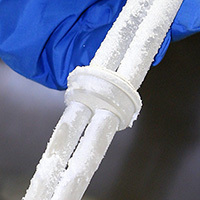 It’s the first commercially-available tubing engineered for flexibility and crush resistance upon removal from a minus 86 degrees C freezer. A video on AdvantaPure’s website shows the test procedures and results. Renovations Encompass Over 40,000 Sq. Ft.
Southampton, PA — NewAge recently completed renovation of 43,000 sq. ft. of existing space at its headquarters near Philadelphia, Pa. The renovated area now houses several new ISO Class 7 and 8 clean rooms for silicone tubing production, molded component operations, quality inspection and packaging for its AdvantaPure high-purity products. Newly constructed warehouse space was included in the renovation. The project took nearly two years from demolition to completion and cost $10 million. Southampton, PA — Three new case studies from AdvantaPure highlight fluid transfer challenges in the biopharm and pharmaceutical industries. One study explores leak-proof container systems coupled with the goal of foam reduction. 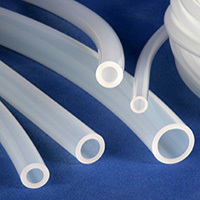 Another focuses on Single-Use molded tubing assemblies in a final fill application. The third examines how a customer decided between movable totes and two styles of clean room wall pass-through systems. Southampton, PA — Tubing manufacturer AdvantaPure announces the completion of BPOG testing on three of its tubing lines used for biopharm and pharmaceutical applications. Two styles of silicone tubing — standard and high pressure — and the company's weldable and sealable TPE tubing now offer full BPOG test results for extractable compounds. Tests were performed by a fully-accredited, third-party test lab using a variety of analytical techniques. Results are available upon request. Southampton, PA — BPOG, the BioPhorum Operations Group, recently developed a best practices guide on forecasting and demand planning involving the biopharmaceutical industry. The guide, a collaborative effort involving biomanufacturers and suppliers, is available from BPOG’s website. It aims to help manufacturers and their vendors improve understanding and communication regarding each other’s needs. A self-assessment tool for measuring companies’ current planning processes is also available from the site. Southampton, PA — Pa. 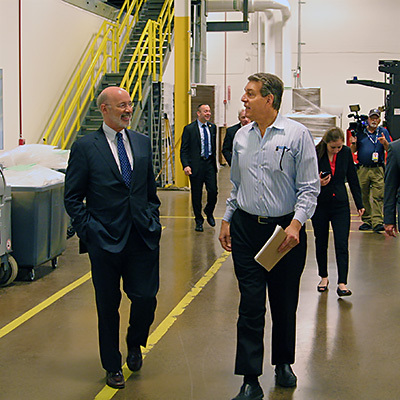 Governor Tom Wolf visited plastic tubing manufacturer NewAge Industries on Monday, May 14, 2018, to discuss employee ownership and how it can be promoted throughout the state. The Governor attended roundtable meetings with current and retired NewAge employee-owners and with CEOs of other Pa. ESOP companies. A plant tour of NewAge’s newly-renovated facility completed the Governor’s visit. Southampton, PA — AdvantaPure has been issued a second U.S. patent for its AdvantaPass technology. The system maintains the separation of room atmospheres to minimize contamination risks in biopharm and pharmaceutical processing. 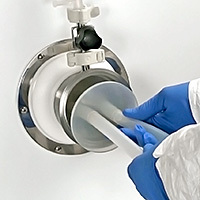 Improvements that warranted the second patent include welded wall portals, the elimination of adhesives and sealants, and adjustable wall flanges. The upgrades offer users more options regarding mounting and using the system.